Technical Sergeant Daniel Hlaváč. Photo: René Volfík. “It was my interest in photography and adventure that first led me to the Czech Army but at the start I took only amateur pictures. 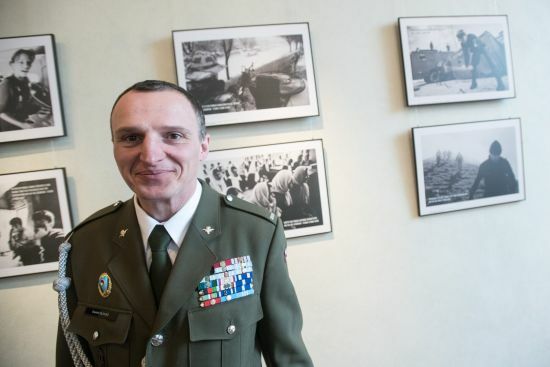 [It was only later] that I got my first single-lens reflex camera at a military shop while serving in Bosnia and Hercegovina.” says Czech Army Technical Sergeant Daniel Hlaváč. On his mission in 2003, he devoted himself fully to photography and has since been awarded several times in the Czech Press Photo competition. Technical Sergeant Hlaváč is responsible not only for his photography equipment but also for additional supplies and water as well as his military weapon - a grenade launcher – together weighing more than 70 kilos. “Sometimes having three cameras along is less than practical,” he admits. But it’s clear the military photographer wouldn’t have it any other way. Photojournalist and documentary filmmaker Jarmila Štuková. Photo: René Volfík. 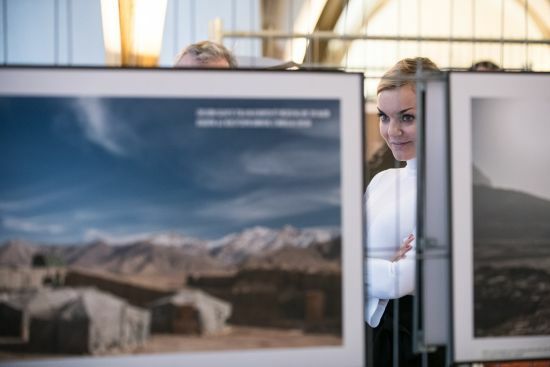 Also at the opening at the Carolinum on Thursday, was Jarmila Štuková, a photojournalist and documentary filmmaker whose work is also prominently featured; Štuková has documented conditions in numerous war-torn and conflict-hit areas including Syria and Iraq. But the country that has arguably captivated her the most, she says, is Afghanistan. “I’ll never forget the first time I flew over the Hindu Kush aboard a Blackhawk helicopter. That was in 2012. It was such a beautiful view. But of course, it is not just nature, but the people. “There are many terrible problems including terrorism but many people are trying to change things for the better. I met many heroic people: women, a doctor working in a burns clinic, and others who are trying to turn things around. One of her best-known images is called Kabul Boys – shows local boys who practice parkour, the discipline requiring participants to get as quickly as possible from one obstacle to the next. In the photo, they practice in the ruins of Darul Aman Palace just outside Kabul. Štuková says she is now returning to Afghanistan to see how things have changed: in some areas security has reportedly gotten worse; all the same she expressed a dedication to help, saying her role has changed from being not only an observer but someone wanting to play an active role. Photographer Jarmila Štuková and Charles University Rector Tomáš Zima at opening of exhibition at Carolinum on March 21, 2019. Photo: René Volfík. That Other Life is open at daily to the public from 10 am to 6 pm and lasts at the Carolinum until April 10, 2019. Admission is free.